“I have been noticing various levels of bermudagrass stem maggot damage in area bermudagrass fields. It is suggest to closely monitoring the current regrowth of bermudagrass for damage. It is usually late in the second cutting or early in the third cutting when damaging levels first begin to appear. Spraying an insecticide as a preventative/prophylactic application is NOT recommended at this time. However, if significant damage is spotted within the last week or so of growth prior to harvest, then the use of the suppression technique outlined on below. Bermudagrass Stem Maggot (BSM) management strategy is contingent upon timing. Below are a few points to consider about managing BSM. If signs of BSM damage occur when the bermudagrass is 6-8 in. 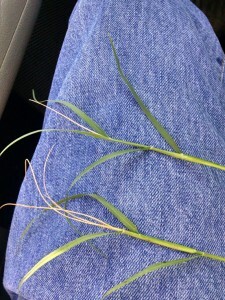 tall, then harvest (remove if possible) and implement chemical suppression technique. The bermudagrass is unlikely to grow out of this damage. Delayed action can rob yield from future growth. If signs of BSM damage occurs late (~3 wk after prev. cutting/grazing), then harvest or graze as soon as possible. 1st App: 7-10 d after hay cutting. Growers should apply a labeled rate of an insecticide. Examples include Baythroid, Karate, Mustang Max, Sevin, malathion, Tracer or Prevathon. Posted in Forages, Livestock. Bookmark the permalink.